The Devil’s Well takes on the world of supernatural investigations. Written and directed by Kurtis Spieler (Sheep Skin 2013), it stars Chris Viemeister (Bridge and Tunnel 2014, Audition 2015) as Lucas Baker and Bryan Manley Davis (Sheep Skin 2013, Hide/Seek 2016) as Bryan Marks in a world focused on solving the disappearance of a woman last seen on the hunt for the paranormal. 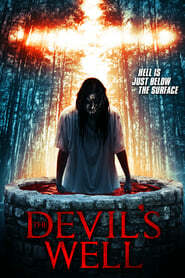 Winner of the Gold Award at The Spo​tlight Horror Film Awards in 2016, The Devil’s Well is a film that excels by matching the values of its production to the strengths of its story. This may sound like something obvious, like something every film must do if it wants to be successful. Typically, this is true – but The Devil’s Well exists within a particular sub-genre of medium-budget Horror filmmaking where it frequently is not, and thus it deserves to be singled out: it is a particularly effective piece of filmmaking not just independently, but within the context of its genre. In fact, it could be argued that the context of said genre actively makes it more difficult for a creative team to produce a film that is interesting from a filmmaking perspective. Simply put, it can be hard to have much in the way of authorial intent when it comes to cinematography when you are producing what is essentially a Found-Footage Horror film that relies on shaky, handheld footage. In trying to be intimate and ‘realistic,’ these films usually lose much semblance of visual intention, and thus become visually disinteresting. The creative team obviously put a great amount of thought into how they would present this film, and it pays off dividends.